As streets age, officials must deal with rehabilitating and reconstructing these pavements to maintain a safe and comfortable ride. In light of nationwide budget shortfalls, cost-effective methods of extending pavement service life must be developed or the overall condition of street systems will continue to fall. Thin maintenance surfaces (TMSs) are a set of cost-effective preventive maintenance surfacing techniques that can be used to extend the life of bituminous pavement–pavement built with hot mix asphalt, hot mix asphalt overlays of portland cement concrete pavements, built-up seal coat (chip seal), stabilized materials, or a combination of these. While previous phases of TMS research have provided information about the uses of thin maintenance surfaces in rural settings, urban areas have different road maintenance challenges that should be considered separately. This research provides city street officials with suggestions for TMS techniques that street departments can easily test and include into their current programs. This research project facilitated the construction of TMS test sections in Cedar Rapids, Council Bluffs, and West Des Moines (all urban settings in Iowa). Test section sites and surfaces were selected to suit the needs of municipalities and were applied to roads with an array of various distresses and maintenance needs. Condition surveys of each test section were performed before construction, after construction, and after the first winter to record the amount and severity of existing distress and calculate the pavement condition index. Because conditions of the test sections varied greatly, determining which surface was most successful by comparing case studies was not feasible. However, some general conclusions can be made from this research. TMSs are suitable preventive maintenance techniques for a municipal street department?s program for preserving existing pavements. Careful attention should be paid to proper planning, quality control during construction, aggregate and binder selection, and aggregate embedment in order to support successful TMS application. 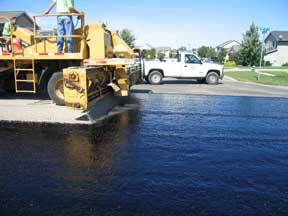 Crews apply a fresh seal coat on a residential street in Cedar Rapids.